Beetle borers. They are very small and they cause a lot of damage to trees, including death. Cal Fire, the City of San Luis Obispo and UC Ag and Natural Resources are offering a workshop to educate the public about these two serious pests. Early efforts and education are key in preventing an attack on a wide range of tree species in San Luis Obispo County. 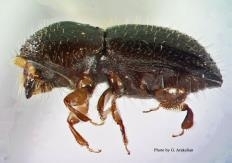 I am excited to announce that we are having an invasive shot hole borer (ISHB) and goldspotted oak borer (GSOB) workshop here in San Luis Obispo on May 9th from 9:30-2:30. This workshop will address biology, identification, surveillance, and management of infested trees, downed wood, and firewood. We'll cover these topics in the classroom, then have a hands-on lab to learn how to identify signs of shot hole borer damage, set up a monitoring program, and sample trees. For more information on the training and to register, visit www.pshb.org. Thank you, Kim, for keeping us well-informed!